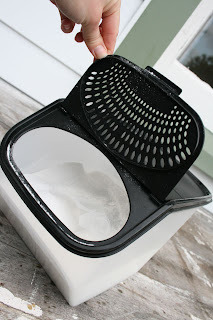 make it perfect: .white stuff. 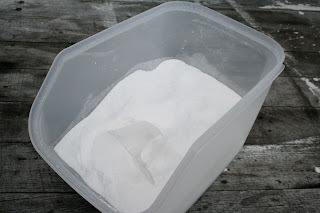 I finally had a go at making my own washing powder. I bought the ingredients for it a few months ago and they sat in my laundry, patiently waiting. I don't like having more than one bottle/box of something opened at a time, so I made myself wait until I had finished my bought box of powder first. I was super easy. I have seen a few variations of making your own washing powder around, but I opted for the trusty food processor method. Everything in, quick whiz and it was done. I didn't grate the soap though as I already had a box of partly used lux soap flakes so I put those in instead. I haven't done the maths, but everyone swears that it is way cheaper than buying your own. Guess it depends what brand you usually buy. Takes a bit of getting used to only putting 1 tablespoon of powder into the big machine, but it seems to wash just as well as anything I have ever used. The only down side is that it doesn't really have a smell...maybe just a bit of a soapy smell. You can put essential oils into the machine if you want to, but the no smell factor doesn't really bother me. P.S. In the events of moving I just realised that I forgot to draw a winner from my last competition (okay....bribe!). Thanks so much for all of the emails and messages I received, they were all very helpful! haha antonio i love your blog :D u just neva know what youll find, i think this 'white stuff' is a winner lol. ive not replied to ur email, i am soo slack! thankyou muchly for it tho, i come home mon, i am soooo coming out for a visit nxt wk! can u teach me to cook and sew and be as cool as you? :D thanks! I am one of Paige's sisters. I too make my own laundry soap. I got so tired of the high prices and not too thrilled about the "extra's" they put in. My recipe is very close to yours, with the exception it is a liquid. I've been pretty happy with it so far. doesnt it make your blended stink? does it go all clumpy if you dont keep it in an airtight container? I have been using this washing powder for months, it is great!!! I was all gung-ho when I found a similar recipe that had water added. It works fine on 100% cotton, but unfortunatelymakes synetic fabric stink. I found that others had this problem as well. I even tried double rinsing-that didn't solve the problem. Now I just use it to treat stains.